Aneurysms, which are tiny blood-filled bulges in the wall of a blood vessel, are responsible for nearly 500,000 deaths a year worldwide when they burst before being treated. Part of the problem in treating them, particularly brain aneurysms, is that they're located among a complex maze of vessels that can be difficult to navigate even with the most modern technology. With that in mind, physicians and researchers in Buffalo have worked with 3D printer maker Stratasys to develop a method of printing out a patient's complete vascular system in just 24 hours in order to practice navigating it prior to actual surgery. Stratasys is working with the The Jacobs Institute, the Kaleida Health's Gates Vascular Institute and biomedical engineers at the University at Buffalo to create the full-body vasculature models. A 3D printed model of a patient's vasculature. The black line is a catheter being inserted by a surgeon in a pre-operative practice. Teresa Flint, a 47-year-old mother of three, was among the first patients helped through the use of a 3D printed model of her vascular system and brain aneurism. Flint had a potentially fatal aneurysm that would typically be treated with metallic basket delivered into the brain through a tiny tube. "We took the image of the aneurysm based on her scans to generate an exact replica of the entire brain vessel anatomy. The Stratasys 3D printed model enabled us to devise a much more optimal means to treat her," said Dr. Adnan Siddiqui, chief medical officer at The Jacobs Institute and a professor of neurosurgery at The Jacobs School of Medicine and Biomedical Sciences at the University at Buffalo. Treatment of aneurisms is typically high-risk, as no two are identical and they require doctors understand each patient's unique vascular anatomy. "Our original plan was to treat her aneurysm with a metallic basket. After attempting the procedure on the 3D printed replica, we realized it just wasn't going to work," Siddiqui said. "Based on the Stratasys 3D printed model, our team was able to pre-empt potential complications and devise a much more optimal means of treating Teresa's aneurysm." Dr. Adnan Siddiqui, chief medical officer at The Jacobs Institute, demonstrates deploying a medical device in a 3D printed model in a research laboratory. Vasculature models are created by first inserting a catheter into the femoral artery in a patient's groin. The catheter is then advanced through a large artery up into the brain arteries where a dye is injected. That dye highlights the arteries, and pictures are taken using an MRI or CT scan. Those images are then uploaded with computer-aided design software to create a virtual model of the vascular system; the model is then used by a Stratasys 3D printer to re-create a physical model of the patient's blood vessels leading to the aneurism. 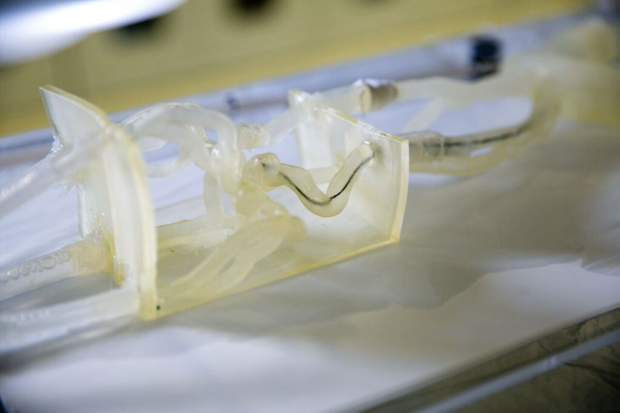 Anthony Vicari, a 3D printing analyst with Lux Research, said that while the ability to model organs -- and even aneurisms -- through 3D printing is not new, he's never heard of a 3D printer creating an entire vascular system from groin to brain. Prior to 3D printing, creating vasculature models took from seven to 10 days using silicon and a mold created from a radiological image, according to Siddiqui. The life-sized vascular replicas are 3D printed at the Jacobs Institute utilizing a flexible photopolymer material called TangoPlus on a Stratasys Objet Eden260VS professional 3D Printer. The material mimics the feel of human tissue and its vascular structure. By accurately reproducing an aneurysm's geometry, doctors can conduct a range of new testing and simulations to devise potential treatments. A 3D printed stroke model with embedded, simulated clot in middle cerebral artery. "It's a true replication of the entire vasculature system," Siddiqui said. "This simulates the actual procedure from soup to nuts. The vessel feel is exactly similar to human vasculature. That's what's really cool about the materials we're using from Stratasys." Siddiqui said he and other researchers are working with Stratasys to use multilayered 3D printing to not only create the surface tension of blood vessels but the distensibility of the vasculature -- whether it's flimsy in the human brain or less flexible and hard like in the heart. "By 3D printing models that mimic vascular feel, we can create an approach I don't think is achievable any other way," said Michael Springer, director of operations at The Jacobs Institute. Apart from speeding up the process, 3D printing models reduce costs from a couple thousand dollars to a few hundred, Siddiqui said. 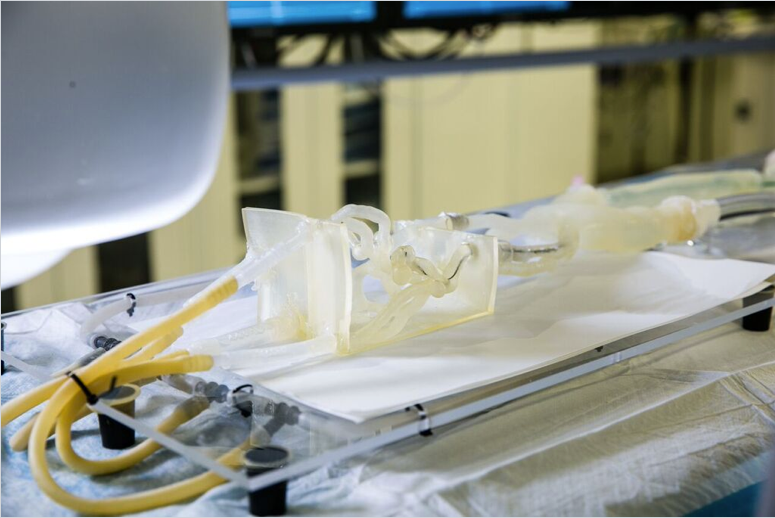 Stratasys' Objet Eden260VS professional 3D Printer used to print patient vasculature models. While surgeons have been using the 3D printed models for pre-operative practice, the models are expected to also help doctors in training. "So residents in training actual practicing physicians can perform stroke intervention," Siddiqui said. "Physicians can do repeated operations on these models."